Click here to preview ANC024. Lightning in the ground: / sparks from grass when / he ran from his parents’ car / to the front door, slight halos / around each daffodil lining / the steps. Grief has long mystified psychologists; numerous theories have been put forth, none of which offer a conclusive rationale for self-inflicting further trauma when faced with loss. What function does bereavement serve? Exactly which unperceived benefit is it that outweighs the cost of suffering? All will experience this paradox at one time or another without ever understanding its purpose. 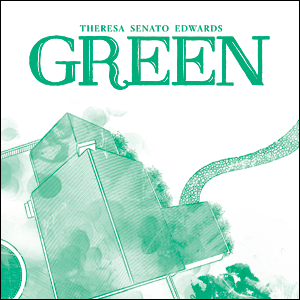 Theresa Senato Edwards does not have the answer to the riddle of sorrow, but does provide an emotive metaphor for the process of grieving and the prospect of hope in her narrative long-form poem, Green. A young man's experiences in his grandmother's house help him to realize his grief in the strange and simple, yet altogether profound manner that befits a man exploring his life and the love that it contains. This poignant story is accompanied by the author's reinterpretation of a piano sonata movement written by herself and recorded some thirty years ago, a metaphor itself for the longevity of warm remembrances. ANC024 is out of print.